If you have followed me for awhile, you know that Teddy has struggled with fine motor skills (FMS) for a couple years. We did not realize the extent of it until we moved here. He was in Montessori school in California and we did not see or hear of any struggles…they used their hands a lot in class, so that came as a bit of a surprise originally. We moved here and the first day his preschool teacher told me it was a huge issue that he couldn’t write his name at 4 years old. So, we began the process of working on writing (a lot!!!) and working with an Occupational Therapist (OT) each week. It took us a bit to find one who meshed well with Teddy, but we did and she has been fabulous. Kindergarten was a bit of a struggle for us. The class itself wasn’t a great fit, but we all worked hard to try and get Teddy where he needed to be. The reading was a hard concept to grasp, as well as the writing. But, we ended kindergarten where we needed to be and Teddy was ready for first grade. Over the summer, we toyed with the idea of repeating kinder, but after some talk with our OT, lots of prayers and lots of talking amongst ourselves, we decided to move forward to first grade. After about a month of school, Teddy was coming home in the worst mood. Just not himself and so off. We could not figure it out. He is a very happy and positive kid typically, so this was so distressing. His OT mentioned maybe something was going on at school. She said a lot of times kids will hold it together at school, then come home and fall apart. Made total sense to me, so, that afternoon, I text his teacher to check in…she replied that we should meet for a chat the next morning. I must admit, I laid awake most of the night worrying because I just knew she was going to tell me he was struggling…I just knew. Mother’s intuition, right? A few friends that I talked to that night, said it might be nothing, but I just knew it wasn’t and I was right. He was struggling big time with the work in class. He was doing it, trying his best, but it was really tough and too fast paced for him. The worst part is, he noticed it. He questioned why he couldn’t get his math finished as quickly as his peers, his writing, etc. So, we discussed the possibility of moving him back to kindergarten to give him an extra year. The consensus from the school was that this was the best option, so that he was not constantly struggling year after year. Obviously, this was the last thing we wanted to do. Mr. Fancy and I had LOTS to discuss and lots of things to figure out before we made a decision. The next day after this meeting, my grandmother passed away, so everything was put on hold. I just could not process anything like that while mourning the loss of one of my favorite people. We ended up having LOTS of meetings with the school to determine what to do. One of the amazing women that I met with, suggested that we get Teddy’s eyes checked. This was so odd to me because he has ALWAYS passed his eye exams at the pediatrician and at school with 20/20 vision. But, I figured you know what, why not? So we made an appointment with a pediatric ophthalmologist. Thankfully, she had an opening two weeks later…the one place I called didn’t have an opening until February! EEEEKKKK! Now, going into the appointment, I was still thinking we would leave with them telling us that his vision was fine, because again, he has ALWAYS passed his eye exams. Five minutes into the appointment, the doctor says to me “Yep, he’s farsighted!” Um, what?! A million things ran through my head at that moment. One of the first things I wanted to do was blame myself. “He can’t see and we had no idea! Of course he struggles with reading…he can’t see for crying out loud! How could we miss this?!! !” But, the doctor must have read my mind because she said “Ashley, you can’t blame yourself. There is really no way you would have known, because he’s probably never been able to see properly, so he doesn’t even know that he can’t see properly.” So, for the next 45 minutes, I watched, I listened and I learned in complete fascination, all about what was going on with Teddy. Not only is he farsighted, but he also has mixed eye/hand dominance, which means it takes him longer to process things…again something I would never have known! Did you know you have a dominant eye and it should match your dominant hand?! I did not! There was so much more that we learned, none of that matters here, but oh how thankful I am for this doctor! I only wish I would have known to see her years ago. But, it is what is it is at this point and we are looking forward, not back! I left the appointment and cried happy tears in my car, because there was finally an explanation for a few of these things. We went right to the glasses shop after our appointment and picked out some glasses and he is thrilled to wear them! We finally got them yesterday! He will wear them all day for a few months and then eventually, they will be school and reading glasses. She believes he will grow out of this eventually. One of the most fascinating things to me about the appointment was that she threw him a ball and he couldn’t catch it. Then she put some glasses on him, threw the ball again and he caught it. We always thought it was just a coordination thing and that he would learn how to catch in his own time. But, he has struggled with catching because he can’t see the ball coming at him! Then, she had him copy some shapes…the one shape was a rectangle with an X in the middle. He drew the shape in 6 different pieces…she said to me “See how he drew the shape? That’s how he sees it, in pieces!” Seriously fascinating. I see a rectangle with an X. Teddy sees a bunch of small, blurred shapes. Her thought is that Teddy has always had this vision issue and that is why he has FMS issues. Of course there is no way for us to know this for certain, but this is the thought. That is why he didn’t use his hands much as a baby and toddler. And that is why, he has never been able to tell us that he can’t see well, because he sees how he has always seen. I am still baffled that this has never been caught before in reading or eye exams. It’s shocking and hard to believe, but the doctor says it happens all the time. The good news is that Teddy is going to literally see the world in a whole new light and we are SO excited for him. Now, the main reason that I wanted to share this is, if your child is struggling in school, consider an eye exam from a pediatric ophthalmologist. Even if they pass their school/doctor’s office eye exams. Until a week ago, I never knew how inaccurate those tests are. I mean, it said Teddy had perfect vision…he doesn’t. I wish I had known this was even a possibility and that we had had his eyes checked sooner. We have always just trusted those tests. You better believe Reagan will headed to see this same doctor in May. She recommends all children to get their eyes checked the summer before they start kindergarten. A week before his eye exam, we made the tough decision to let him go back and have an extra year of kindergarten. As parents, we were so nervous to tell him this news because we just knew he would be devastated to leave his friends. While he was bummed, he was also excited for his new class. He has made such an easy and inspiring transition. Seriously, I am amazed by him. He has not skipped a beat! He has the most amazing teacher and I am so excited for him that he gets this bonus year. His confidence was better almost immediately and he’s only been in this new class less than two weeks. I worried we would regret the decision, but even after finding out about his eyesight, we are confident and at peace with our decision. Just seeing and hearing how much he is excelling, helps to solidify our decision even more and we could not be happier for him. I honestly hope our story helps at least one person. I think it’s always nice to hear other peoples’ experiences, especially with parenting and school issues. It is easy to feel alone and isolated when your child is struggling, especially when you hear about other kids who are thriving in school, reading etc. But at the end of the day, we are all doing our best, kids included! And sometimes, the answer is not the answer you thought it would be! I never thought eyesight could be the root of a lot of our struggles, but it is and we are so grateful that Teddy can now SEE! Watch out world, the Tester is going to do amazing things! XOXO! Oh Ashley! I am so glad you shared all of this! What amazing parents you guys are to listen to your son, his teachers, pray and seek the best thing for him. I’m so encouraged by this post. Teddy is amazing and resilient! You’re doing such a good job mama! What an awesome post! Thank you for sharing! I know it can be embarrassing and humiliating to have a kid repeat a grade but as a former kindergarten teacher, it is the best time to do it! Thank you for stepping out on courage and faith and having your son’s best interest truly at heart! He looks adorable in his new glasses! You are not alone! My son is in second grade and has constantly struggled in school. In preschool his teacher recommended holding him back bc she didn’t think he was ready. But being that he is a twin, as parents we didn’t think it would be fair to hold him back and let his twin sister go on to kinder. So we sent both. He has been on struggle street since day one. We teetered with holding him back but again, would he resent us in future bc his sister was in the next grade, graduate earlier, etc. So we kept on track. Hoping that with extra work and tutoring and lots of extra time put in would help get us on target. Well this past July at his 7 yr well check he failed his eye exam. And he has astigmatisms and is farsighted! Never ever had I thought he had an issue seeing. Reading is now easier. He has advanced in his reading levels in just a few months time and writing and comprehension has become more natural. It’s amazing how much of a difference it makes in all aspects of his life. Even noticing how clumsy he used to be all makes sense now! So kudos to you for doing what you felt right and in holding him back! He will thank you one day. I should have done the same, but it is a hard decision for a parent to make especially given our special situation of being a multiple. Good luck to Teddy! Oh Ashley, I feel your pain. I will never forget when the eye doctor looked at me and told me my son, Kaden, could not see out of his left eye. This had gone undetected for 2 years. Of course, this was natural to him because this was all he had ever known. I know how you felt when you thought you could have fixed this sooner. But, I am pleased to say my son is now in 5th grade. He is a leader in his classroom and makes A’s every report card. He thrives in school and I know Tedster will too. Blessings! Ashley thank you for sharing this. My oldest daughter struggled in school and we had her repeat second grade and it made all the difference in the world. She thrived and loved school. And serioualy teddy looks adorable in those glasses. Hope he has the best year ever !!! We should have help our son back, but regretfully did not. He was our oldest and slipped through the cracks at the Catholic school he attended. He ended up repeating 8th grade and now is excelling in high school. You will never regret that decision! I am also glad you shared this! We’ve been going through something similar with my daughter who is also Teddy’s age. She’s had glasses for a few years because of strabismus (eye turning in) and after a visit with a new doctor last month, she has new glasses and it has been a huge difference especially with reading. It is so frustrating not knowing how and what your child can see. 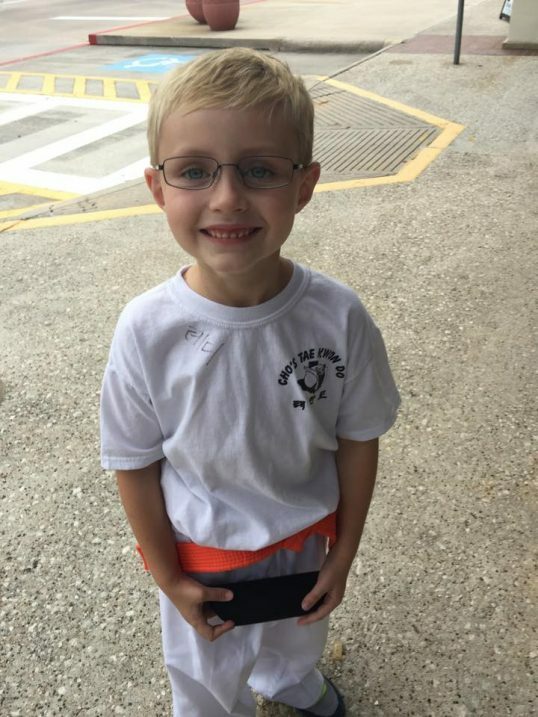 He seems like such a sweet kid, and what a cutie in his new glasses! Thank you for sharing! From one mom to another, I appreciate this post. Such great information for parents. I am a former Kindergarten teacher and had a similar experience with one of my families. I actually recommended they see an eye doctor and get hearing checked as a first course of action to rule things out. As it turns out, there was a vision issue. And coupled with some other things the decision was made to send her back to pre-k. I see the parents occasionally and I can’t tell you how thankful they are that they made that tough decision. She is excelling now and one of the best readers in her class. Cheers to you mama for seeing the big picture. So often parents worry about friendships they child has made and the fact that they won’t be with there “group”. He’s going to thrive! Ah!! So glad you shared this. We made the same decision after much prayer and input to have my oldest granddaughter attend kindergarten a second time. With a cross country move, a new sibling and new living arrangements plus her struggle with reading never improving. Amazingly God put her next door to a speech pathologist who noticed her struggle and diagnosed her with a hearing loss that lead to a processing error. After therapy, which this precious lady did for free!, she was a new student!! Now in the 4th grade she loves reading and school. Honestly that is what I wanted more than anything … For her to like school, which she didn’t and feel successful. It is so easy to listen to others’successful’ child’s story and feel embarrassed for our precious ones. In the end all that matters is that they feel confident, hopeful and encouraged!!! I am so glad you shared this. I have held my daughter back in pre k so I could be sure she will be ready for kindergarten. I have grown up with a learning disability my whole life. It took some great teachers and my parents support to teach me how to carry on life with it. I ended up being senior class president of my high school. And before becoming a mother worked with special needs kids. You are a wonderful parent! And can’t wait to hear of all the success Teddy now has! My heart breaks for you because I know how you feel, my twin boys have had speech issues and I’ve been to specialists, pathologists, teachers, and hearing specialists for years; and I know how it feels to blame yourself. I’m so happy you found answers and listened to your mommy instinct, it shows what an amazing mom you are. Teddy looks so handsome in his glasses, I pray everything continues to go smoothly for you all! Thanks for sharing. My son had similar struggles and we too found out later (in first grade) that we should check his eyes after visiting with an OT. We went to the same type of doctor and sure enough he needed glasses. It made a difference in his handwriting especially. I wish I had known about his struggles sooner, so again thanks for sharing so others may get their children checked. I checked his younger brother when he was in PreK and turns out he had a stigmatism! I planned to get my other children checked when they are old enough. Ashley, Thank you so much for sharing your story. You never know who is going through this too, and will be inspired by your story. You are such a good mommy! Thank you for sharing this story. He seriously looks so adorable in those glasses! I am so glad I read this because I am in my senior year of college on way to becoming an Early Childhood teacher and this is going to help me when teaching children so much! You’re a great mom, Ashley. Always follow your gut instinct with your children. Mothers know best. You are an amazing momma! Thank you for sharing this story. Teddy is just precious in those glasses! As a school counselor and former K teacher, bravo to you. While I know this decision was not easy, it was the right one. I promise you will never regret this gift of time you are giving him. To many realize this when it is too late. Thank you so much for sharing this. My 4 year old started speech therapy this year because he can’t say his two year old sounds. He had a lot of ear infections between 18 months and two and ended up tubes shortly after his second birthday. Because of that, he never learned how to say those sounds. He’s doing well in speech therapy but I’ve already been asking if we should delay kindergarten. He has a late June birthday and school starts the end of July. He’d be one of the youngest in the class as it is. Then you add in a speech delay, it complicates things. How can he learn to read if he can’t say the letters correctly? We know he’s going to need surgery on one of his eardrums so I keep thinking it’s best to wait. I have a few months left to think, but I feel like I’ve already decided to hold him out another year. Now I’m making him an appointment to get his eyes checked because he’s also struggled with fine motor skills. My child can’t catch a ball or write his name. Thank you. From the bottom of my heart, thank you, thank you, thank you. I know this must have been hard to write, but I am so grateful. 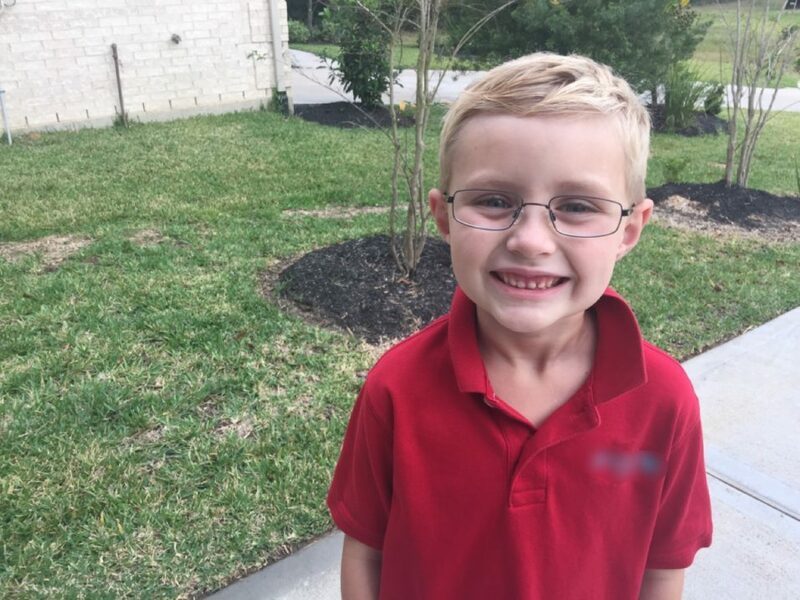 As a teacher myself, I applaud you for making the tough decision to have him repeat Kinder! I have never met a single parent who has regretted either starting their kids later in Kinder, or having them repeat. However, I know countless parents who SHOULD have waited, and regret not. I am confident that you did the best thing for your son! Way to go, Mom!! Ashley, thank you for sharing about Teddy! It brought tears to my eyes. I’m so glad Teddy is now doing great and I can just tell you have a heart of gold and are such an incredible mother! God bless you both! Ash! Wow. What powerful, honest words. Thank you for sharing. Watch out world! You have had a rough couple of months!! I’m so sorry about your Grandma, I know how hard it is to lose one of your special people! You are a great mom! Thank you for writing this and being open. I will now be googling a pediatric optometrist is my area! Ashley, thank you for posting this, even though its so personal. I have missed posts about your family and diy projects/recipes. Though I do understand keeping family more personal in the internet world. This post is so authentic and brave, and I just wanted to say you are a great mom! I just got my son’s hearing tested because I wondered if he could hear, he asks “what” a lot. The test showed his hearing was fine, but his little brain is so busy that he doesn’t process things I say to him sometimes. I’m glad to know it, and mama intuition is usually right- its so great you advocated for Teddy – he will look back and see how much u love him through those actions. And there’s no shame in learning differently or tying again. Our school systems make it hard for kids who need different things sometimes, and hard for teachers to help kiddos (no teacher bashing here- teachers are amazing!). Anyway that was a long winded way of saying, thank u for putting your story out there. Love this! As another reader pointed out he won’t remember kindergarten but will remember feeling confident in school. I was held back in kindergarten and only remember having more time with wonderful teachers and feeling confident in school every single year after that! I think it’s a wonderful decision! You are brave! Teddy is brave! As much as I understand why you are “fashion blogging” now, I love the old blogging you used to do. This type of post, which is more about family and life and things we all go through, resonates so much more with readers and is so much more meaningful than fashion posts. Please don’t forget that! And please don’t be afraid to share this stuff. This is the good stuff. Good luck to Teddy. The glasses look great on him and he’ll have the time he needs this school year to adjust to the changes in his vision with the glasses. Congrats! Based on our experience with our son, I would suggest (if he continues to have any problems at all) that you take Teddy to a pediatric neurologist. Ours ran a multitude of tests and we left with priceless information. Our son struggled with buttoning a shirt and she explained why so he wore polos for YEARS vs. buttondowns. Just one of the many things we learned. We can’t protect our kids from everything but we can prepare them the best we can and we can only do this with tons of information and putting blinders on to what everyone else’s child is doing. Good luck! Thank you for posting about this! My son is the same age as Teddy and he struggled with reading so much in kindergarten. He passed every eye exam and it wasn’t until the summer that someone suggested we see a pediatric specialist. We started this year with glasses and an eye patch…struggling, but relieved to have a piece of the puzzle now. Eye exams are so crucial. Thank you for sharing your story. Thank you so much for your post! I follow you on instagram and randomly decided to read this post. I have a son in kindergarten this year and he is doing well academicially. He has had a little trouble with his behavior and focusing at school. I had noticed that he has trouble when he is reading switching between lines and he sometimes tilts his head. He has not loved reading so it is a struggle to get him to read. After I read your post, I called and made an appointment. He needed glasses! He will get them sometime next week and I am so excited about watching the difference it will make. Thank you for being so transparent…especially on a blog with people you don’t know!